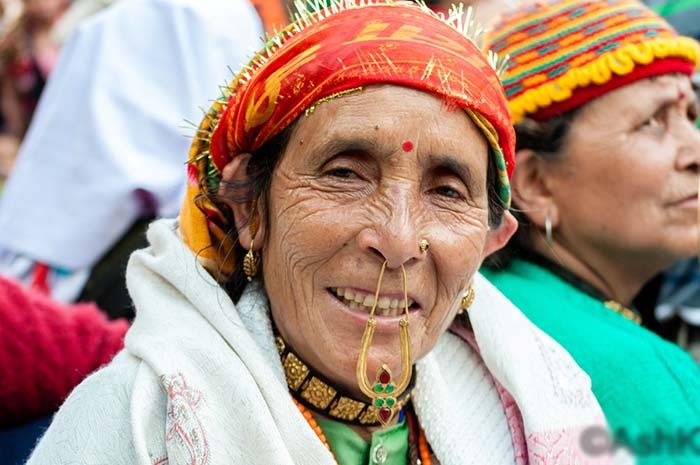 The beautiful Pahari women of Uttarakhand are fond of wearing jewellery specially crafted in silver or gold, adding grace and femininity to their personality. 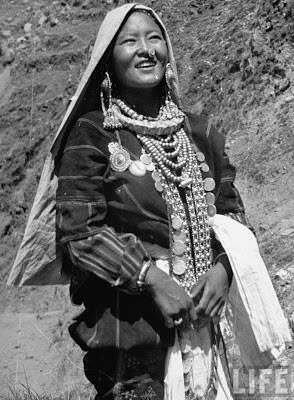 If you have ever visited the hills, you must have seen Pahari ladies donning traditional jewellery pieces such as Bulaq (gold or silver nose ring), Kundal (gold or silver earrings), Paunje (silver anklets) etc. The extravagant gold necklaces such as Hansuli, Chandan Haar, and Galobandh are also worn with great pride. But with time, these jewellery pieces are losing their identity as Pahadi women are getting more inclined towards the contemporary modern designs and the traditional jewellery pieces have become a rare sight. Now, most of the Pahadi women can be seen adorning the modern jewellery designs that are luxe and precious but lacks the elegance found in the traditional designs. So let’s revive the traditional Pahari jewellery by showcasing its lustre to the world. 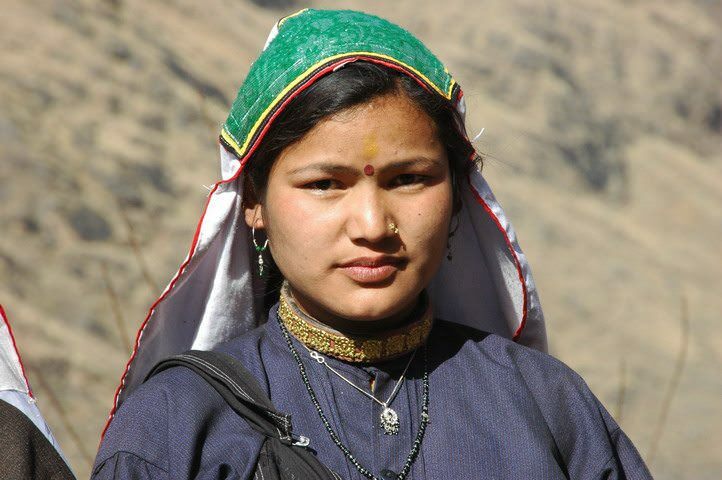 1) Nathuli- Nathuli or Nath is the charm of Pahari women which is hailed for its elegant style. It is worn by the women of Garhwal, Kumaon and Jaunsar-Bawar region of Uttarakhand. However, the style and design may differ in both the region but its charisma remains the same. 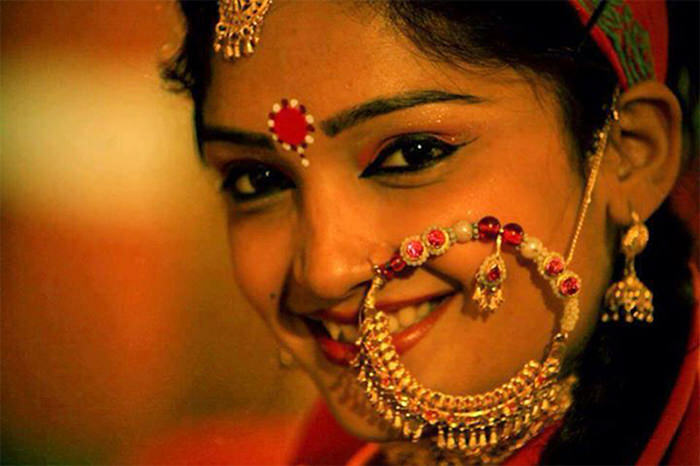 The nath or nose ring of a bride is the star attraction during the wedding. The weight and number of pearls inserted in a nath indicate the status of the family of the bride. 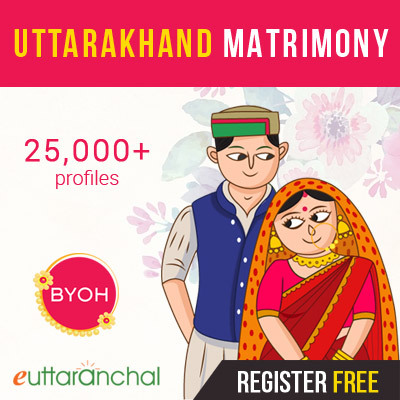 Tehri Nath celebrated for its artistic design is one of the most distinguished ornament of Uttarakhand which is worn at the time of marriage, social gatherings, puja and at important family functions. This large piece of jewelry not only showcases the rich culture of Garhwal but it has also become a fashion statement which attracts a lot of Pahari as well as non-Pahari brides to wear it. 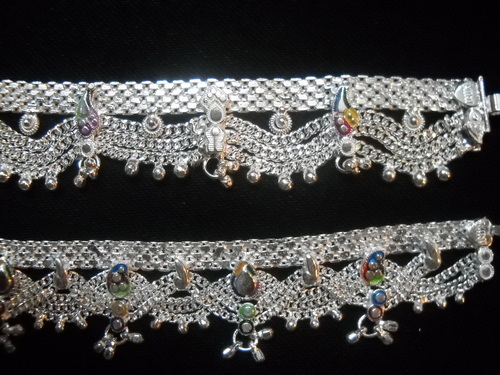 2) Galobandh– Galobandh also known as ‘Galabandh’ is one of the prominent jewellery of Kumaoni culture. This elite neck piece is donned by Kumaoni, Garhwali, Bhotiya and Jaunsari women. The Galobandh as the name suggests is tied around the neck and is only worn by the married women. The uniqueness of Galobandh is that it is designed on a red belt, on which the golden square shaped jewellery pieces are beautifully arranged with the help of a thread. Though being an elegant jewellery it is getting out of fashion as modern jewellery has captured the markets, making no room for traditional ornaments. While the ornament is highly liked by the rural women it is not much popular among those who reside in the cities. 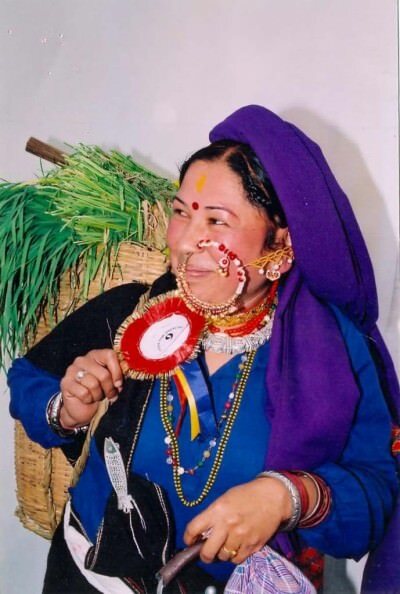 3) Hansuli- Hansuli also known as ‘Khagwali’ in Garhwali is a popular ornament which is clutched around the neck. This gorgeous neck piece which is preferred in gold by rich people and silver by the less affluent or poor. 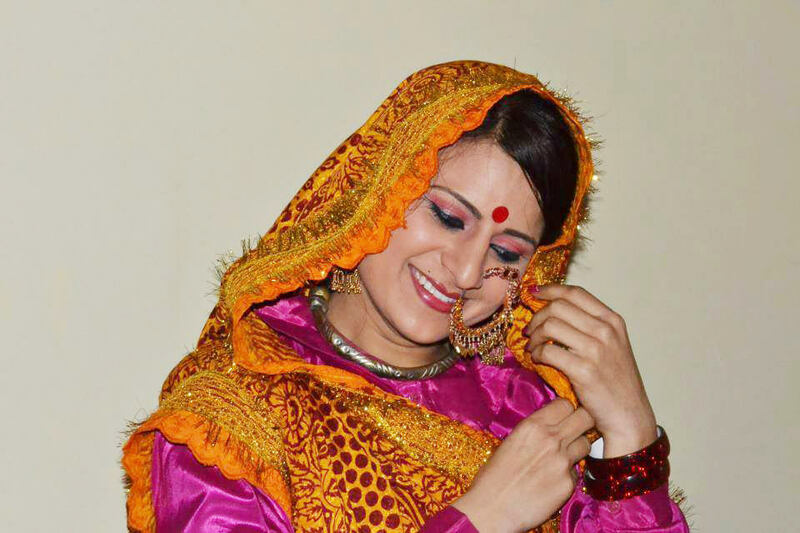 Hansuli is worn by Garhwali, Kumaoni, Jaunsari and Bhotiya women. This priceless jewellery is sported during festivals, weddings, fairs, social gatherings and important family functions. Hansuli is considered to be a classic jewellery piece that brings out the beauty of Pahari women. But in this modern era, the charm of Hansuli is fading as people are getting attracted towards the precious jewellery. If this continues no sooner the traditional jewellery will lose its entity as nobody will wear it. 4) Bulaq- Bulaq is an exquisite jewellery which is worn at the nasal septum. It is peculiarly designed by the skillful goldsmiths who carve intricate motif designs on it. In the yester years, it was worn by the women of Garhwal, Kumaon and of Jaunsar belt. But nowadays the craze for Bulaq is over and now it is considered as an old trend. 5) Dhagulu- Dhagulu or Dhaglu is a round shaped bangle which is made out of silver. It is a common piece of jewellery in Nepal and is worn in some places of Kumaon since it shares the borderline with Nepal. 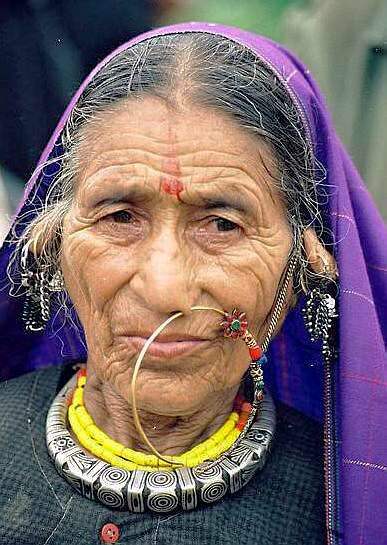 Even today, a few old women of Kumaon can be seen daintily carrying this exclusive jewellery. 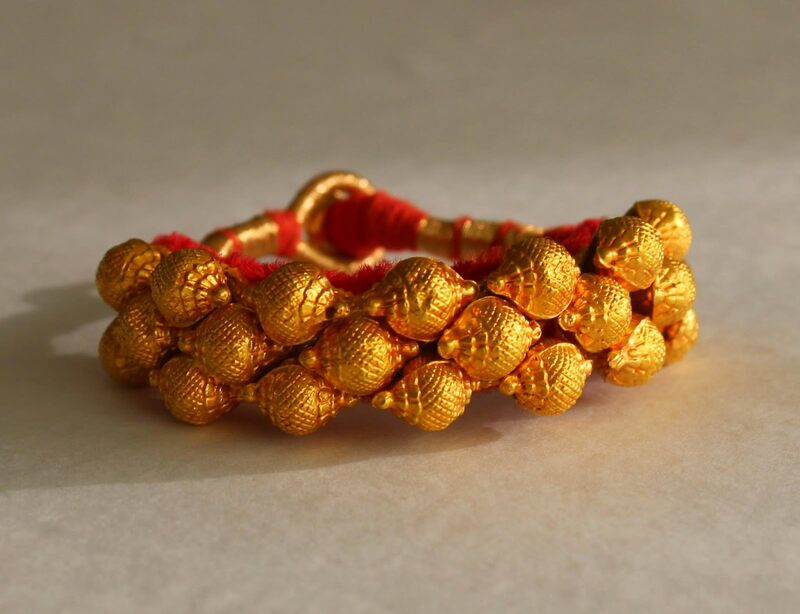 6) Pahunchi- Pahunchi are basically bangles that are made out of gold and are quite popular in both Garhwal as well as Kumaon region of Uttarakhand. 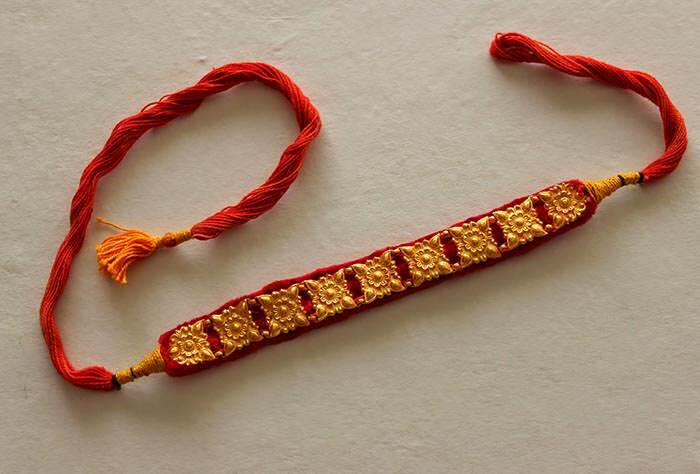 In Kumaon, Pahunchi is considered to be an auspicious jewel for the married women and is worn at the time of festivals and important family functions. Pahunchi is generally made in 1 tola or more which depends on the status of the bride’s family. A red coloured cloth is used as the base material on which the pure gold pearls are studded. The colour red is used as it is considered to be propitious for married women. 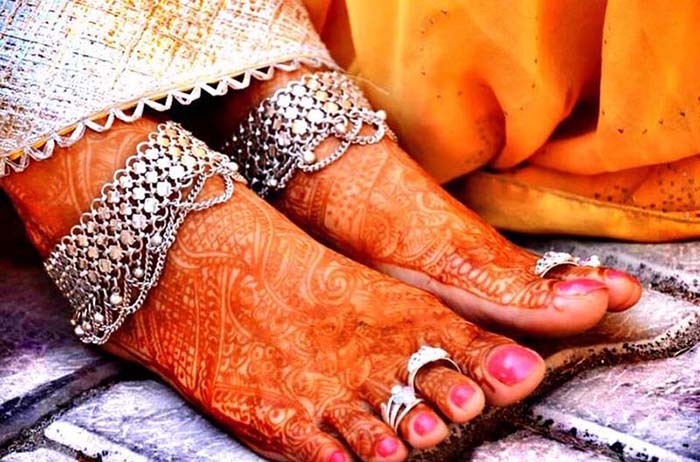 7) Pauje- Pauje is basically an anklet that is made out of silver or copper and is slightly different from payal or pazeb worn by the Indian women. A complex web-like design is made in payal that is accentuated with Indian motifs. While in Pauje a lot of ghunghroos or metallic bells are used. Though the designs of pauje may differ in Kumaun, Garhwal, and Jaunsar but it is one of the most commonly worn ornaments of Pahari culture. 8) Bichhuwa- Bichhuwas are toe rings that are worn by Garhwali, Kumaoni, Jaunsari and Bhotiya women. It is made out of silver and is decorated with intricate designs consisting of Indian motifs, peacocks, flowers, and petals. 9) Kundal or Balis- In local language Kundals are known as ‘Munad’ , Murkhli, Munda, Balli, Tugyal etc in different regions of Uttarakhand. 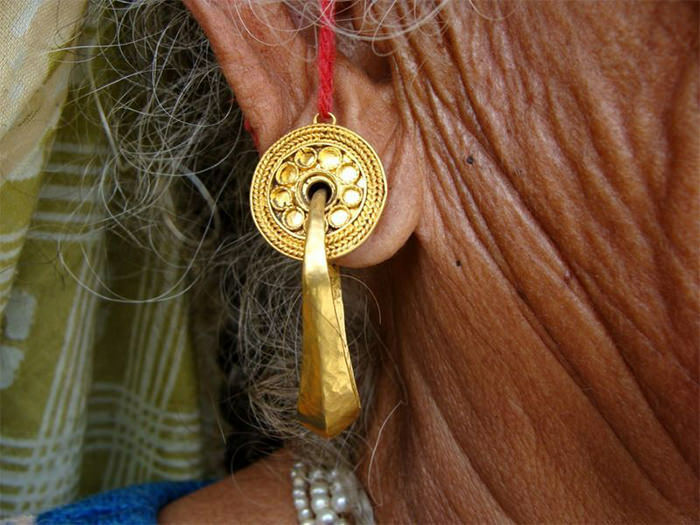 Kundals are earrings that can be seen decorating the ears of the Pahari women. They are either made in gold or silver and its shape and size may differ according to the preference of the woman and her status. Nowadays the traditional designs have been replaced by new and fancy designs. On the other hand, balis are referred to the mammoth size gold earrings, having a circle shape. They are made out of gold and are donned by most Pahari women. 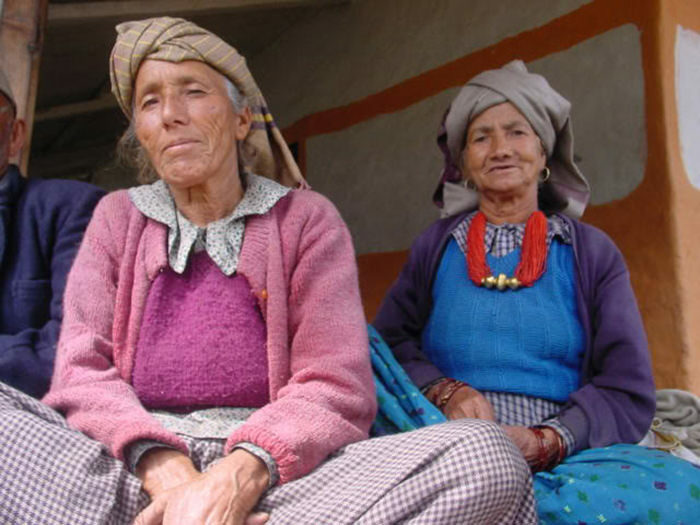 10) Kamarbandh ( Tagdi or Tigdi)- Kamarbandh is worn around the waist line which is garnered by the women of different communities of Uttarakhand. There are two types of Kamarbandh one is made out of cloth the other is made out of silver. It is worn over the traditional attire and tied around the waist to make it appear more feminine and delicate. 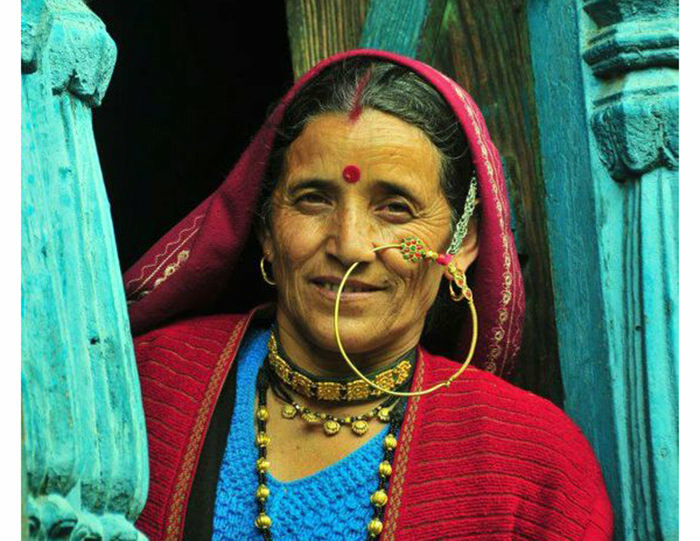 Many Garhwali and Kumaoni women still sport this unique jewellery that adds five-star to their beauty. Charyo: Crafted in gold and silver, these beautifully designed necklaces are worn by married Pahari women only. Kanfool or Karnfool : As the name suggests Kan-fool i.e. Flower of Ear is worn on the earlobe. It is a masterpiece of the classic era jewellery worn by the Pahari women. Other honourable mention includes Kanthi Mala, Mungo ki Mala, Chawanni Mala, Thwaq, Gongkhle or Bajuband, Jhinwara, Pauta, Imarti, Timanya etc. Hi. Greetings! Nice compiled data. Can I get some info on the scientific utility of these ornaments. I am planning a research paper on it. 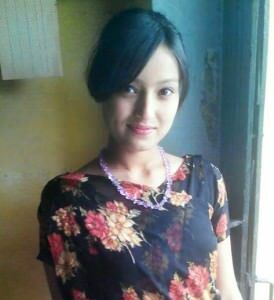 Charyon is mangalsutra basically.. and what you have shown is Nepali necklace which is wrong information.. Thanks pragati for your crisp information which today’s generation are loading. But why the haar or necklace isn’t mentioned?? Pragati I like ur thought. Good work Md Chauhan! We rarely see such traditional content on internet and actual life …. Great job pragati chauhan ji …but some more ornaments is missing.. So you have to add more n complete the article….. Any way gud job . What is the minimum weight of this type of nose jewellery? It looks heavy. I think it requires large hole in the nose. Is it possible to wear in newly pierced nose? There are many more tradition pieces like.